4 Fig. 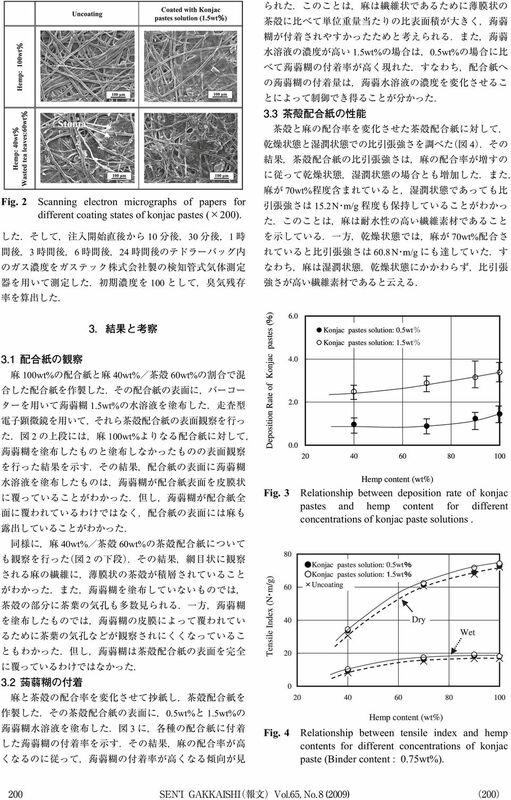 2 Scanning electron micrographs of papers for different coating states of konjac pastes ( 200) wt% 0.5wt% 4 70wt% 15.2N m/g 70wt% 60.8N m/g 100wt% 40wt% 60wt% 1.5wt% 2 100wt% 40wt% 60wt% 2 0.5wt% 1.5wt% 3 Fig. 3 Fig. 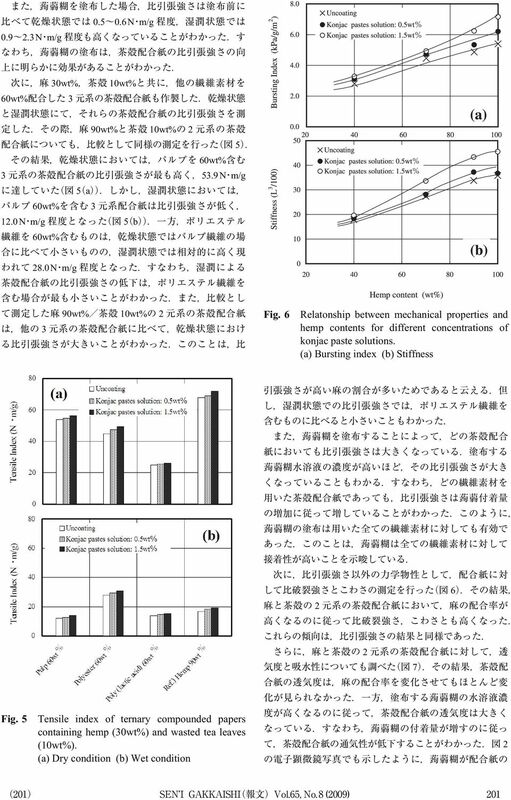 4 Relationship between deposition rate of konjac pastes and hemp content for different concentrations of konjac paste solutions. 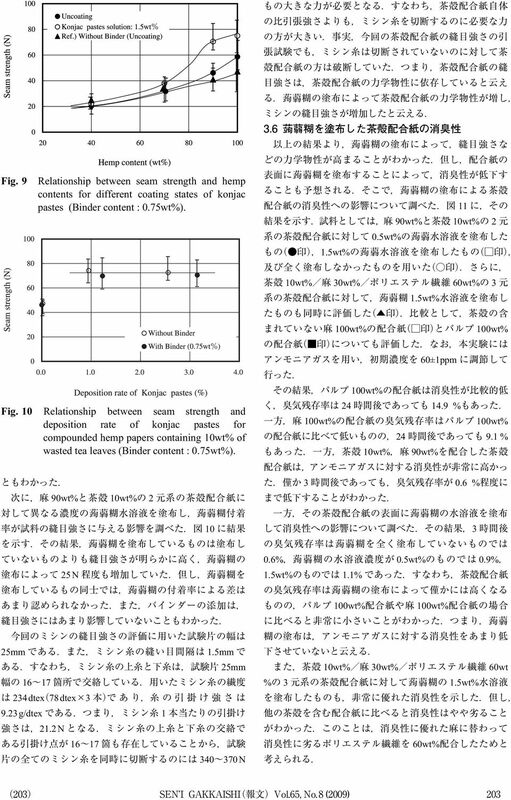 Relationship between tensile index and hemp contents for different concentrations of konjac paste (Binder content : 0.75wt%). 8 Fig. 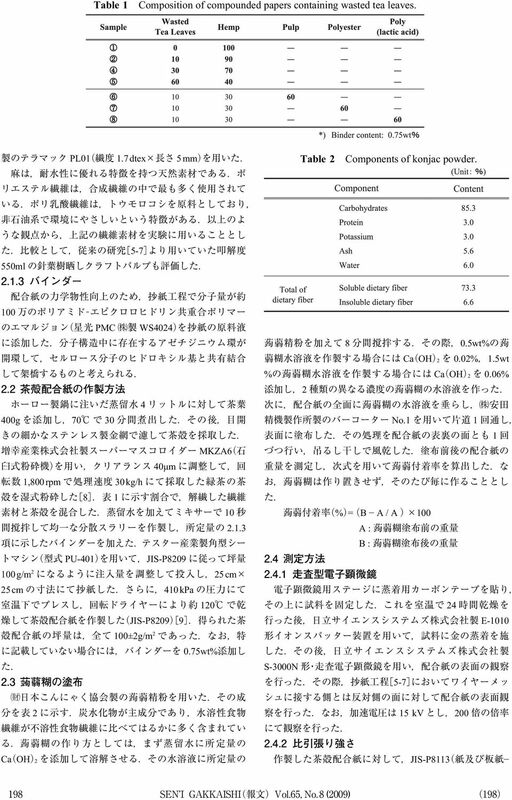 11 Deodorization of compounded papers containing 10wt% of wasted tea leaves for different concentrations of konjac paste solutions (Binder content : 0.75wt%). Initial ammonia gas concentration is 60±2ppm wt % 1 1. 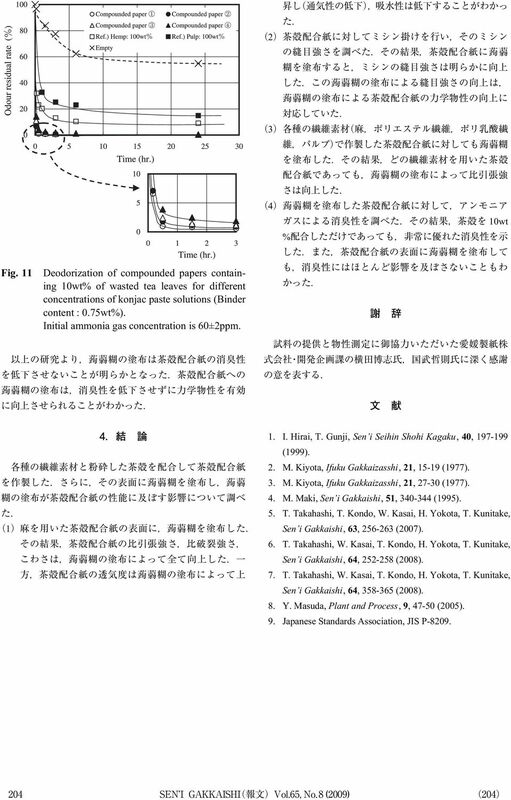 I. Hirai, T. Gunji, Sen i Seihin Shohi Kagaku, 40, (1999). 2. M. Kiyota, Ifuku Gakkaizasshi, 21, (1977). 3. M. Kiyota, Ifuku Gakkaizasshi, 21, (1977). 4. M. Maki, Sen i Gakkaishi, 51, (1995). 5. 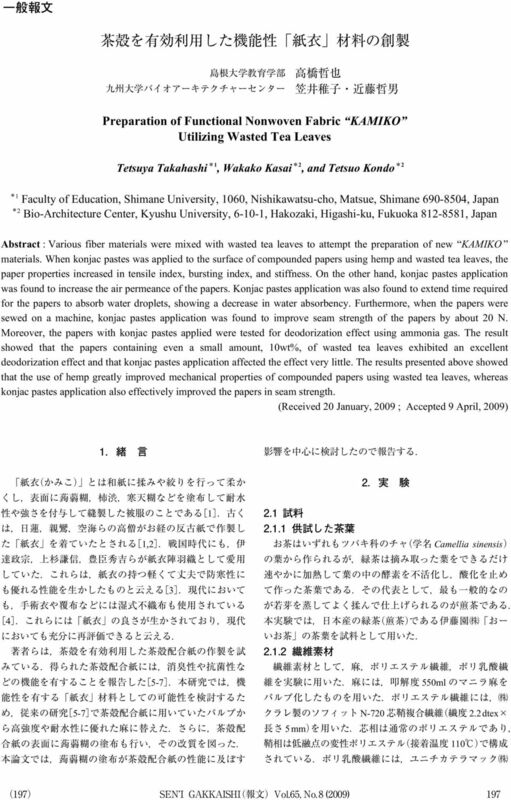 T. Takahashi, T. Kondo, W. Kasai, H. Yokota, T. Kunitake, Sen i Gakkaishi, 63, (2007). 6. T. Takahashi, W. Kasai, T. Kondo, H. Yokota, T. Kunitake, Sen i Gakkaishi, 64, (2008). 7. T. Takahashi, W. Kasai, T. Kondo, H. Yokota, T. Kunitake, Sen i Gakkaishi, 64, (2008). 8. Y. Masuda, Plant and Process, 9, (2005). 9. 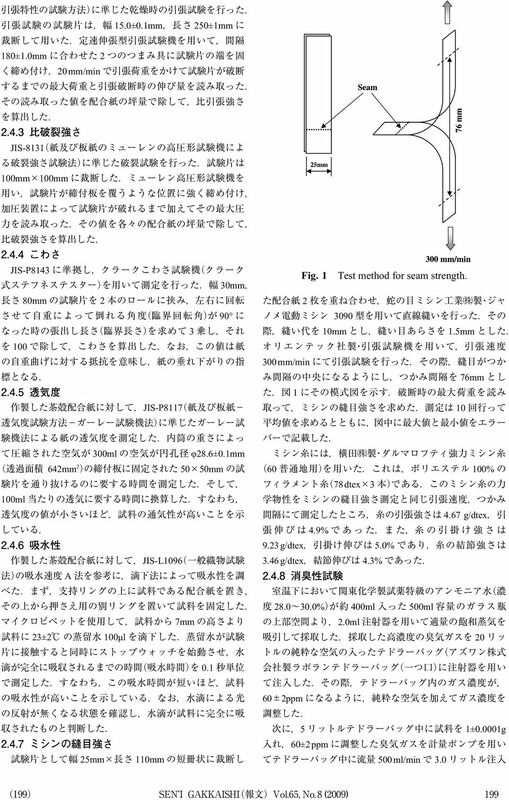 Japanese Standards Association, JIS P-8209.